Forsythia bloom the same in inner city yards. Buildings burned in anger, leaving scars from the shock of murdered leaders. Spring’s season makes no class distinctions. And imbibe the sun’s yellow. History records and thwarts charred Blackness. As they evolve into adolescents of motherhood come too early. 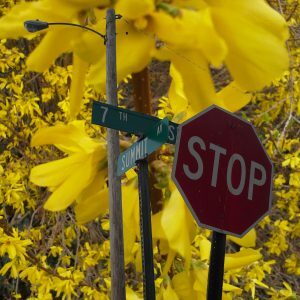 Come, children, dance among the forsythia. Dance while your limbs move alive.